Similar to The Four Davids, he is utilizing a Famous Statue and a Historical Painting Style for inspiration. 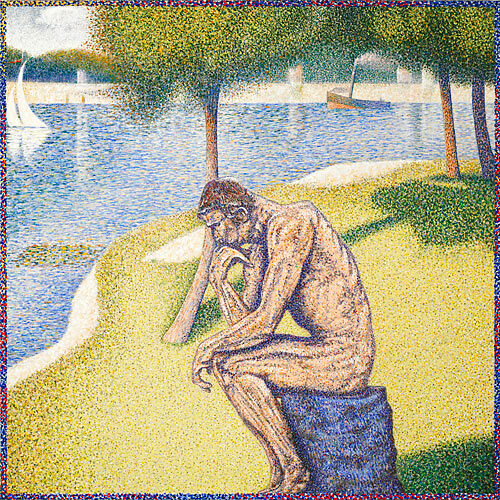 In this instance, Rodin's Thinker and Georges Seurat's A Sunday on La Grande Jatte (which Seurat completed in 1886). Michael researched extensively while working on this painting—visiting Art Institute Chicago several times (to see Seurat's painting) and the Rodin Museum in Philadelphia (to see The Thinker). This invaluable, up close reference, enabled him to achieve the very specific detail in the finished piece. The Thinker 1886 is being offered as a giclée on canvas print, with a limited production of 195 signed and numbered prints. The canvas measures 28" x 28".